Excerpt from U.S. Coast Guard “Proceedings of the Marine Safety & Security Council” magazine by LCDR David O’Connell, U.S. Coast Guard Office of Maritime and International Law. Port state control is an internationally accepted process through which a nation exercises its authority over foreign vessels when those vessels are in waters subject to its jurisdiction. MARPOL Annex I regulates the discharge of oil from ships. It is also designed to control the operational discharges of oil and oily waste that accumulate in ships as a result of normal operations. The handling of oily waste is a constant challenge because it is continually produced, and the operation and maintenance of pollution prevention equipment takes time and effort. Additionally, disposal options can be costly. This has led some vessels to discharge oily waste overboard in direct contravention of MARPOL requirements. Oil record books, which capture all related onboard pollution prevention efforts, are examined regularly as part of the Coast Guard’s port state control program. Indications that large amounts of oily bilge waste are being discharged may indicate that there are substantial problems in the machinery space or elsewhere within the ship. Irregular entries or a lack of entries may indicate that pollution prevention equipment is not being used properly and there is a potential violation. In the most serious cases involving intentional discharges of oily waste or attempts to deliberately deceive Coast Guard port state control officers, the case can be referred for criminal prosecution. Unfortunately, incidents of non-compliance with MARPOL Annex I requirements are on the rise. To combat this, the Coast Guard developed guidance on procedures to detect and respond to potential MARPOL Annex I violations. · soundings taken during the inspection that do not match the latest entries. 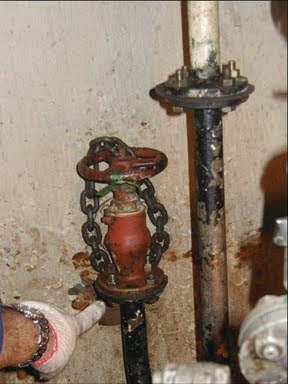 · oil stains around pollution prevention equipment or overboard piping. Despite the guidance being fully transparent to the marine industry and the success the Coast Guard has had in detecting and prosecuting these cases, discoveries of illegal operations continue at an alarming rate. In part two we will examine Coast Guard prevention and detection efforts. Photo Caption: Tell-tale signs of tampering include new bolts, different-colored piping, paint chipped from frequent handling, and oil stains on the bulkhead. Full article is available at http://www.uscg.mil/proceedings/summer2009. The marine life is fully contaminated through various ways and there is little hope that they will be remedied soon enough.There are also illegal operations I see.